Worms and science fiction go hand-in-hand, probably because humans have a visceral reaction to worms. Here's ten worms that have really raised the bar on nastiness. WARNING: You might not want to read this if you're eating. 10. Jeff from Men in Black II (2002) - One of the funniest moments in MIB II is when Agent Jones seems to be interrogating a flower, and it turns out to be attached to a gigantic worm named Jeff. The worm lives in the New York subway, and is big enough to bite a train car in half. I've had some bad commutes, but that would put me off public transit altogether. 9. Space Slug from The Empire Strikes Back (1980) - When Han Solo parked the Millennium Falcon in an asteroid, he never expected the strange tunnel to fight back. Quickly, he discovered he had basically parked inside a gigantic worm. Think about the fact that he was walking around in the worm's slimy guts. Nasty. 8. Shai-Hulud from Dune (1984) - The Shai-Hulud, also known as sandworms, are the big daddies of worms in science-fiction. Worshiped by the native population as gods, these enormous worms (that can grow miles-long) burrow under the sands of the planet Dune and destroy anything they detect on the surface. They also create the highly prized spice, melange. 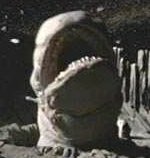 The sandworms are nasty both because they're giant worms, and because they can eat whole vehicles. 7. Centaurian Slug from Star Trek (2009) - In the new Star Trek movie, the evil Romulan Nero sticks a worm in Captain Pike's mouth to force him to talk. This worm actually was inspired by the Ceti eel in Khan, so the Ceti eel is getting double duty on this list. 6. Graboid from Tremors (1990) - When people start getting sucked.underground, Kevin Bacon and friends discover gigantic worms under the earth that hone in on vibrations and pull you in. 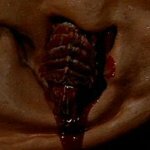 Not only are the graboids giant worms, but they have smaller tentacles inside their mouth sthat look like smaller worms. Much like Freddy Krueger made it scary to fall asleep, this movie made just walking scary. 2. The Creeps from Night of the Creeps (1986) - When it comes to horror, it seems like all the most terrifying ideas have been done to death. Except the idea of an alien worm that jumps up, forces itself into your mouth, burrows its way into your brain to turn you into a zombie, then hatches more worms until your skull explodes. That hasn't gotten old. 1. 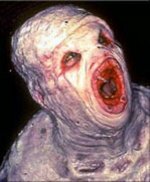 The Flukeman from The X-Files - In the X-Files episode "The Host," they find a hideous parasitic creature, half-human, half-flukeworm. The creature was humanoid, so some might quibble over whether the Flukeman deserves to be on this list. But remember, technically, he was a giant flukeworm. Worm, get it? Okay, well, if the Flukeman bit you, he would implant eggs that made you puke up baby flukeworms. That nasty enough for you? Which one of these alien worms grossest you out most? 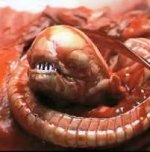 Are there other alien worms that you think are nastier? Let us know in the comments.